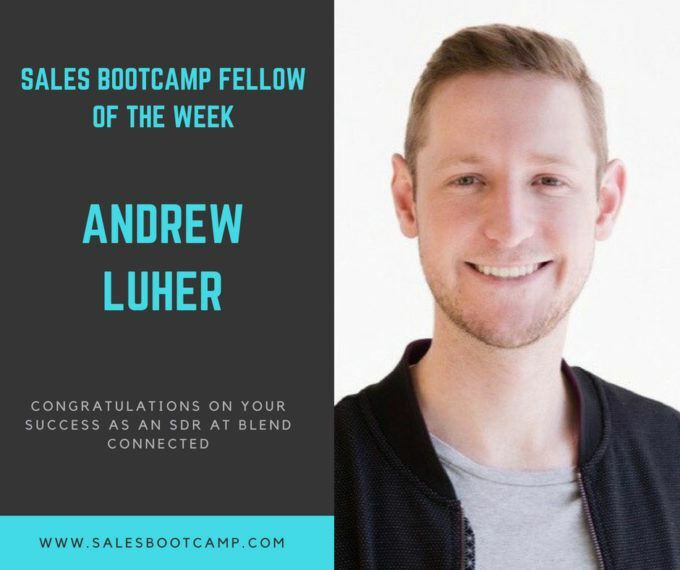 This week, we are highlighting Andrew Luher as Sales Bootcamp’s Fellow of the Week. Andrew was placed at Blend through his Sales Fellowship, and converted to a full-employee after only 10 weeks. As one of Blend’s first SDR hires, he immediately added value to their team. Now that the team has more than doubled, Andrew has been taking on more of a training role for the new SDRs to show them the ropes. Andrew’s transition from his previous job to working at Blend was very smooth with the help from Sales Bootcamp. He was passively looking for a new job as he was living and working in Southern California when one of his good friends was hired as an SDR job through Sales Bootcamp. His friend told Andrew about his great experience and recommended that he reach out as well to go after the tech sales opportunities. Andrew quickly submitted signed up through our website, submitted his resume to Sales Bootcamp, and took the initial online bootcamp. The course was very helpful in Andrew’s transition from the mortgage industry to sales as it helped him learn the industry, terms, and the process of being an SDR. Once Andrew took the course and was ready for a job placement, Nick, Sales Bootcamp’s Director of Sales, introduced him to Blend for an initial interview. Right from the start, Nick did a phenomenal job of matching my experience with the actual job. Blend has a great product and it’s a high-growth start-up right in the Financial District. It was a dream job for me. Once Andrew re-located to San Francisco for this opportunity, it was an easy transition. In his first few weeks at work, he shadowed the sales team to absorb and learn. He had calls with his Sales Bootcamp Fellowship Coach every week, where he was able to practice cold-calling and develop email templates. These coaching calls gave him the confidence to try different strategies in his role. He ultimately had a mentor to bounce ideas off of and learn specific techniques from that he wasn’t able to pick up just from shadowing his team. Because Andrew was one of Blend’s first SDR hires and their sales team wasn’t fully built out yet, his Sales Bootcamp Fellowship Coach was a great resource for him to practice Blend’s pitch and receive supplemental coaching for the role. In the most recent quarter, Andrew ended up a little over 200% quota! He has definitely proven to be an all-star, combining his sales education and training with his own grit and work ethic. Andrew has truly enjoyed the sales profession so far. In my last role I was doing a decent amount of selling, but being in software sales and B2B sales has been a lot of fun. Everyone around me has been super supportive. We are sharing knowledge and it has been a good union of my background and everyone’s willingness to help as well. I’ve felt supported by Blend from day one. I think being strategic in the outreach and really developing a solid plan with your Account Executives is a really good way to be successful. Instead of the “spray and prey” method, we’ve seen more success in tailored messaging. I will look at LinkedIn and Google News Alerts, and send an email to leads with a reference to an article that is relevant to them. I’ve been working with the AEs to come up with a targeted plan of attack for certain accounts. Secondly, trust the process. All those calls and emails that go unanswered, you have to think of it as just another shovel of dirt- the pot of gold is down there. We are excited about Andrew’s development and growth in his sales career. I’m definitely very thankful to Sales Bootcamp for finding the job for me in the first place, hurrying along the interview process, and being there for me to ramp up. Working with Sales Bootcamp definitely shortened my learning curve and I was able to ramp up a lot quicker than if I found Blend on my own. We are proud of your work at Blend, Andrew, and look forward to supporting your ongoing success!